I went to add some Southern Gospel music to my website tonight, and I found some uplifting music at AllSouthernGospel.Net (based in Alabama); but then to my horror I heard popular Seventh-day Adventist (SDA) preacher, Doug Batchelor, saying on their radio station that Hell is not a literal place of burning fire and eternal torment for Christ-rejecters. Kindly, Doug's errant rationale is that a loving God would never punish someone in eternal fire for not loving Him back. Mr. Batchelor is a false prophet of the worst sort, because he professes to be a Christian, when HE IS NOT! 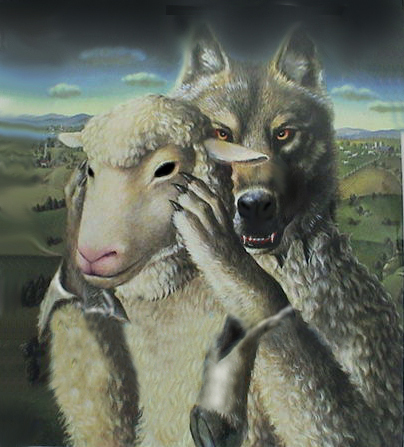 Seventh-day Adventism (SDA) has over 18 million members worldwide, all deceived by the Devil. The Devil is infiltrating churches today with counterfeit Bible versions, the satanic heresy of Lordship Salvation (Calvinism), the heresy of Zionism, the homosexual agenda, Masonic church programs, ecumenical ties such as the AllSouthernGospel.Net website, et cetera. In short, the churches are going to Hell. It is dangerous spiritually that SDA's have aligned themselves so closely to the truth, when they are so far away at the same time concerning the Gospel, clearly not Biblical Christians. Please beware of the satanic false religion of SDA. I kindly say, “satanic,” because it is Satan who ultimately provides umpteen substitutes to blind the minds of men from the truth of the Gospel. 2nd Corinthians 4:4, “In whom the god of this world hath blinded the minds of them which believe not, lest the light of the glorious gospel of Christ, who is the image of God, should shine unto them.” SDA's are very sneaky. You know, I've never heard SDA's promote songs on their radio station about the Investigative Judgment, or the year 1844, or singing that you don't have to worry because there is no place called Hell that burns eternally with fire. Instead, they play the same Gospel music that born-again Christians listen to. This is very deceitful. I am not trying to be mean and I have nothing personal against anyone in the Seventh-day Adventist religion. I am a born-again Christian. 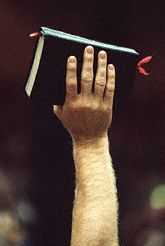 I am also an Independent Fundamental Baptist, but being Baptist doesn't make me a Christian. I have a problem with SDA because they teach many false doctrines which totally contradict the Word of God; such as, Lordship Salvation, Investigative Judgment, and denying a literal burning Hell for all Christ-rejecters. SDA's claim that Ellen White is God's voice to the world to clarify the prophecies of the Second Coming of Jesus Christ. This is total nonsense and contrary to the Holy Scriptures. Despite some snazzy worldly music that I would never approve of, most of the music on AllSouthernGospel.Net is superb, heart-uplifting, great, country Gospel music. I love John Bowman's music! What a great voice that God has given him! The SDA radio station plays music by both SDA's and genuine Christians. This misleads the listener to think that SDA's are also Christians, but they cannot be because of their doctrinal positions that teach ANOTHER GOSPEL. I needed to write this article to warn others that Seventh-day Adventism is of the Devil, regardless of how “Christian” they may seem. The disturbing truth is found in SDA's core doctrinal beliefs, as taught by Ellen G. White in her numerous writings and books. SDA's revere Ellen White more than you could ever imagine unless you're part of their religion. In fact, without Ellen Gould White there could be no Seventh-day Adventism, because their entire religion is based upon her alleged visions from God, her bizarre claim that Christ entered into the heavenly Holy Place in 1844, and their obsession with the Sabbath Day (which Colossians 2:14-16 plainly teaches was nailed to the cross). Jesus Christ is the fulfillment of what the Sabbath Day symbolized, which is, the Savior in Whom we completely rest for forgiveness of sins and eternal life (Hebrews 4:10-11). In SDA, they don't like to talk about their bizarre doctrine of “Investigative Judgment—A false teaching literally invented by their founder, Prophetess Ellen G. White. This strange doctrine, exclusive only to SDA, teaches that in the year 1844 Jesus entered into the heavenly Holy Place to begin His end-time work of investigating every believer, judging who is worthy to have eternal life. SDA's try to manipulate (wrest) the word “sanctuary” from Hebrews to concoct this strange doctrine, which is absolutely unbiblical. In sharp contrast, the Bible teaches in the book of Hebrews that Jesus sprinkled His precious blood once and for all upon the heavenly Mercy Seat, in the Holy Place in God the Father, on our behalf (Hebrews 9:12, 24; 12:24). Hebrews 9:12, “Neither by the blood of goats and calves, but by his own blood he entered in once into the holy place, having obtained eternal redemption for us.” By the time Hebrews was penned in 63-64 A.D., the Lord had already applied His liquid blood to the heavenly Mercy Seat. The Devil is subtle, a beautiful liar. We read in Revelation 12:9 that Satan is deceiving the whole world, and will continue to do so until Christ's Second Coming. Sadly, this deception includes most of the churches! Heresy is creepy into our fundamental churches by the hour! There is a raging debate in the churches over the meaning of repentance. The AllSouthernGospel.Net plays some very beautiful and inspiring southern Gospel Christian music; but ironically, they are NOT saved themselves. If any SDA is a genuine Christian, it is only because they have repented (changed their mind) and abandoned official SDA teachings, believing the Gospel instead. SDA dogma is NOT the Gospel. Ellen G. White plainly taught that works are necessary for salvation, as does Calvinist Paul Washer and other popular heretics. Satan has infiltrated the churches with the heresy of salvation by grace plus works. This is what some heretics in Acts 15:1 were teaching in Jerusalem. Acts 15:1, “And certain men which came down from Judaea taught the brethren, and said, Except ye be circumcised after the manner of Moses, ye cannot be saved.” Here is Evangelist Paul Washer clearly teaching that without works no man can be saved. That is heresy! Baptist churches today that teach the heresy of Lordship Salvation are in the same damned boat to Hell as Seventh-day Adventists! I'd guess about half of Baptist churches today, including the Southern Baptist Convention (of whom Paul Washer is a member) have been deceived. A popular voice in Baptist churches today is Evangelist David Cloud, who errantly teaches a perverted form of grace plus works for salvation. The Devil's greatest weapon is to con people into living the Christian life without ever being born-again. Like it or not, in Acts 2:41 we read that 3,000 people were saved is just one day. No one grilled the crowd to see who was willing to forsake the world, cease from sinful behavior, surrender all to Christ, follow Jesus and confess Christ before men. Like it or not, it is simple and easy to be saved. You can be saved instantly, and know for the rest of your life 100% that you are on your way to Heaven. This is because salvation is of God and not man. Eternal life is dependent upon God's faithfulness, not ours. When Paul Washer, Ray Comfort, John MacArthur and others teach that you cannot write the date, time and place when you were born-again, they are teaching heresy! I thank God for Michael Bowen, whose doctrinally sound book is a continual blessing to me and so many others, clearly showing forth “the simplicity that is in Christ” in the Gospel (2nd Corinthians 11:3-4; 1st Corinthians 15:1-4). Please listen to “Caught between Grace And Works” (MP3) by Pastor Ralph Yankee Arnold. The truth is that a man can have a change of heart and life, and yet not be born-again at all. Evangelist Ray Comfort says if you're still living in sin as a professed Christian, you may not be saved. My friend, even if you're living an upright life, you may not be saved. YE MUST BE BORN AGAIN! (John 3:3). Salvation has NOTHING to do with the life you live; but rather, HAVE YOU BELIEVED THE GOSPEL? (Windows Media Video by Dr. Hank Lindstrom). You can change your mind about many things, but that doesn't mean you are saved. A Change of heart would be called “Reformation.” Salvation is not reformation, nor education, nor rehabilitation; but rather, REGENERATION!!! SOURCE: Ellen G. White; Book: Steps To Christ; Chapter: Growing Up Into Christ, pg. 67. So what does it mean to be born-again? It means that a person is born into God's family. If you are not saved, then God is not your Father. If you are an unbeliever, or a false believer, God is your Creator but not your Father. When you become a born-again Christian by believing the Gospel, you immediately become a child of God. Once you get saved, you are a permanent member of the heavenly family, and you can never be disowned for any reason. We read in Acts 10:1-2 about a good man named Cornelius, who feared God always, prayed, and gave alms to the poor. Yet, this devout religious man, whom the local community highly respected was still unsaved, on his way to the fires of Hell forever. Thankfully, God told Cornelius in a vision to go meet the Apostle Peter, so he could hear the Gospel preached and get saved (and he did)! Amen! Cornelius got borned-agained!!! That how they say it down south.... he got borned-agained! Hallelujah! Ellen White is Seventh-day Adventism! And Seventh-day Adventism is of the Devil. She is a false prophet. Being born-again does not happen when your heart changes. The new birth is not a new attitude toward sin, God, people or anything. So what does it mean to be “born-again?” The Biblical answer is found in John 1:11-13, “He came unto his own, and his own received him not. But as many as received him, to them gave he power to become the sons of God, even to them that believe on his name: Which were born, not of blood, nor of the will of the flesh, nor of the will of man, but of God.” In sharp contrast to Ellen White's heresies, the Bible teaches that you get born-again by believing on the name of the only begotten Son of God!!! This “new birth” is a supernatural miracle of God, wrought only by God. The “change of heart” which Ellen White errantly speaks about is the result of reformation, education and organization; but it is not that change which can only be produced by the indwelling Holy Spirit (regeneration). Ellen G. White foolishly teaches that once a person's heart changes, they have been born-again. This is ungodly heresy!!! I cannot find one Bible verse which requires a change of heart to be saved, nor do I see anything that teaches we become the children of God by changing our own hearts. According to John 1:11-13 that I just quoted to you, the only thing required to become a born-again believer is TO BELIEVE the Gospel of the Lord Jesus Christ. Jesus died on the cross for our sins by the shedding of His precious blood. He was buried. And then three days later Jesus bodily resurrected from the dead. This is “the Gospel” according to 1st Corinthians 15:1-4. So let me ask you friend. Who are you going to believe? — Ellen G. White, who says that being born-again means having a new heart, a change of behavior, a new outlook, et cetera? Or will you believe the inspired Words of God, which teaches that to be born-again a person must simply BELIEVE THE GOSPEL of the Lord Jesus Christ to be saved? It's your choice alone to make. Please listen to the awesome MP3 sermon, “HE THAT BELIEVETH IS NOT CONDEMNED” (by Dr. Jack Hyles). I didn't write this article to be unkind; but rather, to bring attention to the Devil at work at the AllSouthernGospel.Net radio station. It is my humble opinion that SDA's are exploiting the music of born-again Christians to give a legitimate face to their illegitimate unbiblical religious beliefs. This is how Satan operates according to 2nd Corinthians 11:13-15, that is, he transforms himself to APPEAR as an angel of light. And also, the Devil's ministers (servants) are transformed into ministers of righteousness. They are all better than Hollywood actors! I am not saying SDA's are not sincere. I am not saying they are intentionally dishonest. I am saying kindly that SDA's are deceived by the Devil, and have embraced Ellen White's false teachings (which are a substitute for the Gospel). It is my hope and prayer that people reading my article will become aware of the spiritual dangers of Seventh-day Adventism. You can listen to the most beautiful Christian music in the world daily, crying and praising God in emotional response to the music, and yet go straight to Hell fire in your sins when you die. You've got to get born-again by faith in the Gospel. I have also found numerous SDA websites teaching that water baptism is necessary to have eternal life. Please don't be fooled by SDA, because the Devil wants your spirit, soul and body. The Devil wants to trick you, so that you'll spend eternity burning in the Lake of Fire with him. People can “fall away” from God through choice, pressure, carelessness or inattention. Though God draws us to Himself and will do everything He can to keep us close to Him, He won't force us to stay. SOURCE: “Signs Of The Times” magazine, August 2011. The preceding quote is a false claim. It is heresy! The holy King James Bible teaches the truth—Once saved, always saved! Salvation is a gift, but it cannot be lost, forfeited or returned for any reason. If, as SDA's claim in the preceding quote, eternal life can be lost through carelessness or inattention, then human effort (works) are required for salvation. This is totally unscriptural. Not surprisingly, SDA's deceitfully profess to believe that salvation is a free gift that does not require works of self-righteousness, while simultaneously saying that care and attention are required to keep it. WHAT A CONTRADICTION!!! This type of forked-tongue, double-speak and rhetoric is typical of heathen religious cults, used by Satan to deceive the masses. If you eliminate Ellen G. White, there can be no Seventh-day Adventist religion, because their entire religion is based upon Miss White's alleged visions and teachings. Likewise, without sexual perversion Mormonism ceases to exist. Without the Virgin Mary Catholicism ceases to exist. SDA exists because of Ellen G. White, and because of a failed prophecy of the Lord's return in the year 1844. These are all manmade satanic cults, who are all very wrong on the plan of salvation! Ellen White's book titled “Steps To Christ” is a roadmap to the Lake of Fire!!! Her book effectively requires works for salvation. In Miss White's book titled, “The Great Hope,” she plainly teaches that works are necessary to be saved. Sadly, this is what Calvinists like Dr. John MacArthur and R.C. Sproul are teaching today, which heresy has crept into many Baptist churches. Please listen to the the wonderful MP3 sermon by Dr. Ralph Yankee Arnold titled, “Easy-Believism.” I care about you friend, which is why I wrote this important article. I love good Christian music. I love the old hymns. I also love southern Gospel music. But when I hear SDA's promoting Doug Batchelor's satanic heresies, and the SDA religion, then I must warn OTHERS in Jesus' precious name! For SDA's to play Christian music by genuine born-again Christians (who are not SDA's), is like the Planned Parenthood abortion business using the song “Jesus Loves The Little Children” for their sinister organization's motto. Just because SDA's play Christian music sang by non-SDA's on their radio station, doesn't make them born-again believers! You need to be aware of this. SDA's have painstakingly tried to “Christianize” their public image, hiding their core beliefs; such as the belief that all churches who worship God on Sunday are part of the ANTICHRIST Beast system! Yes, SDA's consider all Baptists part of the Beast system of Antichrist!!! Please don't let the Devil trick you into a false Gospel that will take you to Hell forever. If SDA's are right, you've got nothing to lose by avoiding them, because they deny a literal burning Hell. But if the Word of God is correct, and what I am telling you, then you'll burn in Hell forever if you follow Ellen G. White's performance-based salvation. Let me give you an illustration of how the Devil works. I heard about a young married couple in the Philippines who moved from the rural countryside into the big city of Manila to find work. When they got there, a man who heard they were looking for a place to rent led them to a friend of his, who claimed to be a landlord. The two men showed them the empty apartment, and then took their security deposit and first month's rent. After the couple and their young children moved-in, the police evicted them later that afternoon, because it was someone else's home. The two men had lied to them, conning the couple out of hundreds-of-dollars. This is how the Devil works, who promised Eve an empowered life in exchange for disobeying God. Eve learned the hard way that Satan is a beautiful liar. THE DEVIL IS A LIAR (John 8:44)!!! The Bible plainly warns us that Satan and his ministers falsely APPEAR as the good guys! Please understand this Biblical truth!!! I love everyone, including Seventh-day Adventists; but they have been lied to by Satan. Ellen White was a false prophet, now burning in Hell. I say that with sadness. There is a fine line between religion and faith, between damnation and salvation. The world's churches are filled today with religious people who are going-through-the-motions, even telling others about Jesus (Matthew 7:21-23), who've never been born-again by BELIEVING the Gospel of the Lord Jesus Christ. Salvation is so easy and simple that most people pass right over it, missing it completely, accepting a satanic substitute instead. The Bible teaches in Matthew 7:13-14 that the gate is narrow, and straight is the way, which leadeth unto life, AND FEW THERE BE THAT FIND IT!